I’m always on the lookout to break from the confines of my studio to record another episode of Spinal Column Radio. Whether it’s firing up the mic to podcast on a sandy beach, conduct an interview while soaking in a hot tub, or introduce our show at 2500 feet from the backseat of a Cessna, my creative side is always thinking ahead. Such was the case when I approached Dr. Graeme Gibson for an interview atop the grave of our profession’s first patient: Harvey Lillard. A bit morbid? …perhaps. But once you understand the backstory, you’ll understand why I did it. I’ve always really enjoyed chiropractic history, with all of its twists and turns and hidden gold nuggets — so much so that I catch myself, here in the Northwest, gazing forlornly at Davenport, Iowa. It was in this quaint town that chiropractic got its start. On September 18, 1895, Dr. D.D. Palmer delivered a legendary adjustment that would not only restore hearing to his once deaf janitor, but would birth an incredible profession. Little did I know, however — little did most know — that our famed first patient would eventually leave Davenport and travel west to Seattle to live out his remaining years. Chiropractic history had been sitting, or rather lying, in my own backyard all this time! 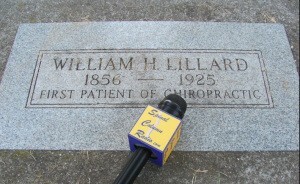 As I sat on the parched lawn interviewing Dr. Gibson with the body of the first chiropractic patient six feet under us, he began to recall the incredible story of how the nearly forgotten resting place of Lillard was rediscovered by a group of curious and tenacious Puget Sound chiropractors. Dr. Thomas Lamar (left) interviews Dr. Grame Gibson (right) on Spinal Column Radio. Gibson (left) and Lamar (right) atop the grave of Harvey Lillard while podcasting on SpinalColummnRadio.com episode 140. When he was a boy, his family moved to Seattle. Because his dad was a chiropractor and mother a staunch advocate for our profession, he grew up steeped in chiropractic. Dr. Gibson remembered the barbeques his parents would have with fellow chiropractors — during which the rumor of Lillard being buried somewhere in Seattle continually surfaced. Determined to get to the bottom of this “urban legend,” his mother rolled up her sleeves in the days of pre-Google and headed to the city library, scouring newspaper obituaries and cemetery records. To her astonishment, she found one William Harvey Lillard buried on September 7, 1925, at Lake View Cemetery in Seattle, Washington. Armed with this information and an old map of the burial grounds, the “Chiropractic Barbeque Group” set out to find Harvey. With anticipation high, they navigated their way to an older, lesser maintained portion of the grounds arriving at Lillard’s gravesite — only to find nothing there but dead grass. No monument. No tombstone. In fact, no marker of any sort was present to indicate that he, or anybody else for that matter, was buried there. Rising above the feeling of dejection, one of the chiropractors in an “Indiana Jones-like fashion” marched to his car, popped the trunk, and grabbed a tire iron. With sharp attention to the map, he carefully paced the gravesite and then planted the rod firmly into the soil. Thud. He had hit something! Quickly the group began to dig below the sod and to their amazement a temporary grave marker identifying Harvey Lillard was revealed. But as amazing as their find was, it must have been tempered with disgrace. How could our profession have forgotten about someone so important? Eighty-seven years later (to the day) Dr. Gibson and I sat atop the grave of our profession’s first patient to not only honor and pay homage, but to awaken others to do the same. As our conversation about Harvey and his impact on chiropractic drew to a close, it felt good to see the setting sun’s orange rays reflecting on what was now a proper grave stone — a marker that not only identified Harvey the man, but credited his historical contribution to humanity. Dr. Thomas R. Lamar is a chiropractor at Anchor Chiropractic in the Health Services Center and hosts the Internet radio program SpinalColumnRadio.com where you can listen to this special graveside interview (episode 140). Lamar can be reached at (360) 297-8111. This entry was posted on September 18, 2013 at 6:00 am and is filed under chiropractic history, podcast, Tales Behind the Mic. You can subscribe via RSS 2.0 feed to this post's comments.